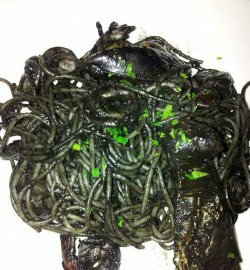 My friend invited me to this high class Western restaurant to try his favourite dish, which is the Squid Ink Spaghetti ($23++). For the price of $23++ per plate, is really expensive and I was really surprised of its high price, but fortunately taste great! Generous portion of sliced squid has make this dish very fragrant and flavourful. Spaghetti is very chewy and portion is generous. THe black sauce did not really make it taste bitter, but rather make it taste delicious. Restaurant environment is very cosy and cooling,service was excellent and friendly.